A hygrometer is a measuring tool. It is used to measure the amount of moisture that is present in the air around you. That moisture content is known as humidity. The hygrometer tells you how much moisture in present with a reading of the percentage of water in the air. An accurate hygrometer for home use can measure that moisture content and provide you with a reading that is known as the Relative Humidity (RH). The RH can have an impact on your health and of your belongings, including your home and furniture, and this is why it is important to monitor the moisture content of the air in your environment. These are considered one of the most accurate of the hygrometers. The dewpoint is the temperature at which a sample of moist air at a constant pressure will reach water vapor saturation. This saturation temperature cools resulting in water condensation. They work with a chilled mirror and an opto-electronic mechanism that detects the condensation on the surface of the mirror. The dewpoint temperature results in readings with an accuracy of 0.2 degrees C and humidity readings to +/- 0.5%. This device is the most accurate primary method of measuring moisture content in the air. It works by measuring the mass of an air sample and comparing that to an equal volume of dry air. This device is extremely accurate. In fact, national standards have been developed in Japan, the European Union, the United Kingdom, and the United States with the Gravimetric hygrometer. It is not an easy device to use and is typically the tool used to calibrate other hygrometers. The temperature of a mirror at the point when moisture starts to condensate is known as the dew point. A chilled mirror hygrometer records this temperature and converts it to a humidity reading. They are available in manual and automatic styles. The accuracy of this type of hygrometer is variable as they can easily be contaminated. Dust, gases and anything else that can collect on the mirror and can affect the reading. These devices are commonly used in metrology laboratories. A human or animal hair held in tension is the main feature of this measuring device. The length of the hair will change in accordance with the amount of moisture that is in the air. The length of change results in a humidity reading. A salt-impregnated paper strip that is attached to a metal coil absorbs the moisture in the air. The strip changes shape relative to the amount of moisture it collects. This change in length results in a dial reading. This is not a very accurate device. Using two different thermometers – one dry and one moist with distilled water on a wick or sock – this system is referred to as the dry-bulb and wet-bulb. When the temperature is above freezing, water evaporating from the wick lowers the temperature. When the air temperature is below freezing, the wet-bulb is coated in ice but may be warmer than the dry bulb. The relative humidity is determined from the ambient temperature on the dry-bulb and the difference between both bulb temperatures. 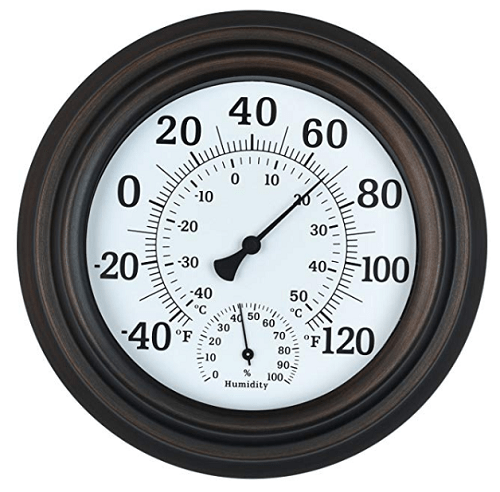 An analog hygrometer generally has the appearance of a round clock face. Instead of telling the time, this style of hygrometer displays the relative humidity with a pointer that aims at the percentage of moisture in the air. They are quite accurate. The dials are typically large enough to see and read easily from a distance. These measuring devices are housed in a sturdy metal case and can be hung from an interior or exterior wall. Readings can be understood with just a glance. They can also have a built-in thermometer – these devices are sometimes called thermo-hygrometers. For a more detailed look at some of the best analog hygrometers on the market, please see this article for more information. A digital hygrometer is very different in appearance than an analog style. In addition to not having a clock face, the digital models can display more than just relative humidity. A digital hygrometer can also display time, temperature, high and low reading history, and have preset alarms built-in. Depending on the device, they can read both indoor and outdoor humidity simultaneously, with sensors placed at different locations around your home, or where you want them. The sensors send back the data to the base unit wirelessly. Humidity meters for outdoor use are usually constructed to perform under all types of weather conditions. However, they can also be used indoors as well. The indoor designs are not weather-resistant and are best used indoors only. 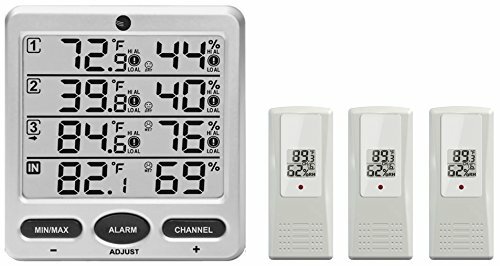 This wireless hygrometer/thermometer is designed to provide both indoor and outdoor humidity readings. It has the ability to display readings from up to three remote sensors and has a large 4-inch LCD backlit display with touch screen. The display shows the time, maximum and minimum temperature and humidity readings. There is also an arrow reading to indicate trends related to weather and humidity. The outdoor humidity meter has a 200-foot remote range. This unit can be used on a tabletop or mounted on a wall and has a magnetic back design for easy placement. This wireless outdoor hygrometer requires a single AAA battery to operate and one is included with the package. 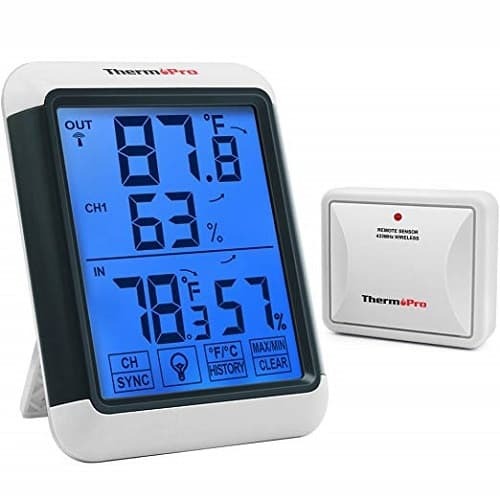 Featuring an 8-inch round face, this outdoor thermometer hygrometer is easy to read and has an attractive design to fit any décor. The design includes a glass lens with digital readout that is accurate between -40 and 120 degrees F.
The construction of this device includes a precision-made coil that not only provides accuracy, but will automatically calibrate. All you have to do is leave it in a fixed location for two hours and it will display local conditions accurately as one of the best outdoor hygrometers. This is an amazing outdoor thermometer and humidity gauge. It has Swiss-made sensing components which provide accurate and reliable measurements. It is equipped with ‘set it and forget it’ set up and will send readings to your phone via Bluetooth 4.0. As it is wireless, the signal with the readings can go as far as 325-feet under ideal conditions and will alert you if there is a problem. You can monitor your temperatures and humidity via Apple iOS or Android devices. If you are looking for an affordable, easy to use and simple to read outdoor humidity gauge, the WS-10 is your best bet. It includes an indoor thermo-hygrometer inside a console plus three remote sensors for use outdoors. The console displays remote readings from all sensors and updates them regularly. This unit is designed to operate up to eight different remote sensors. It has audible and visual alarms to tell you when pre-set limits have been exceeded. Featuring Swiss-made sensing components, this outdoor temperature and humidity gauge provides accurate and reliable measurements. The temperature range is from -20 to 60-degrees C with a humidity range of 0-99%. You can upload recorded data to your phone via Bluetooth. The unit comes with a LCD screen that will display current temperature and humidity. It also tracks hourly, daily, monthly and yearly maximums and minimums of both. Batteries are included and will last up to 6-months making this one of the best outdoor hygrometers. 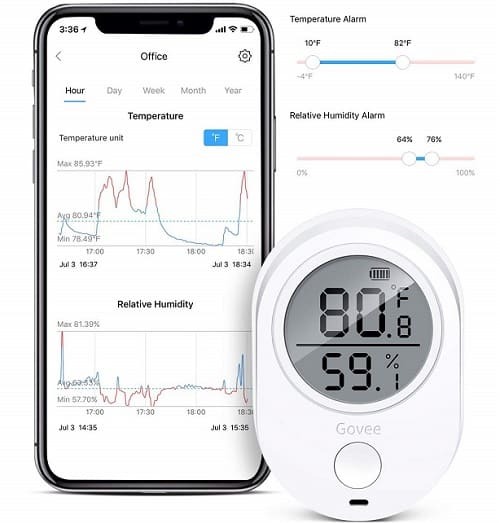 The Govee Home app works on both iOS and Android and provides you with accurate data direct to your phone and the range of the thermometer/hygrometer is up to 230-feet. 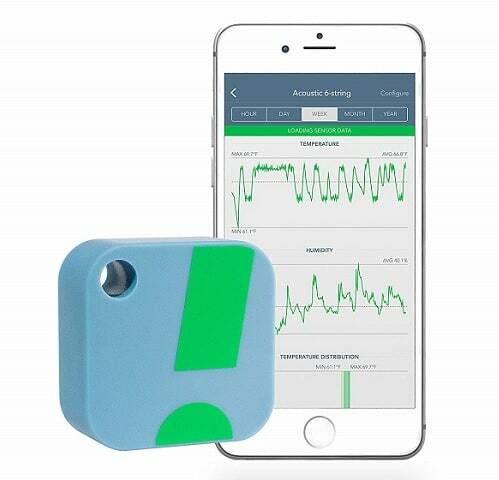 The wireless sensor can be placed anywhere outdoors for additional readings. Tracks all kinds of data and records for comparing readings over time. For humidity control inside your home, you can’t go wrong with a hygrometer combined with either a humidifier or dehumidifier. For outdoor humidity monitoring, any of the best outdoor hygrometers listed above would be effective.